WICHITA, Kan. – June 17, 2013 – Cargill’s Wichita-based beef business is sponsoring “Help a Hero Come Home,” via a ground beef initiative designed to raise money and awareness for Homes for Our Troops. More than 1,600 U.S. military veterans have incurred life-altering combat injuries during Operation Iraqi Freedom, Operation New Dawn and Operation Enduring Freedom, requiring specially adapted homes. Homes for Our Troops, a 501(c)3, non-profit, charitable organization created in 2004, has built more than 130 homes in 35 states and now builds approximately 40 houses annually. This Cargill ground beef initiative will include in-store ground beef promotions and burger grilling events throughout the United States over the next 12 months. Funds raised from various activities will be used for materials and labor to build homes that will be provided to qualifying injured veterans at no cost. Cargill beef retailers will have the opportunity to display point-of-sale materials in support of the program, including posters, signage, on-pack stickers applied to ground beef products, checkout lane donation forms and regionally tailored handouts. Additional promotional elements will include a special paint scheme on the No.6 Cargill Beef Ford Mustang driven by Fenway Racing’s Trevor Bayne on June 28, 2013, in the NASCAR Nationwide Series race at the Kentucky Speedway. 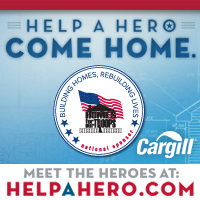 There will also be a dedicated website – HelpAHero.com – that will provide more information on Homes for Our Troops and its mission, in addition to instructions regarding how to make a donation. We are Homes for Our Troops, a national non-profit, non-partisan 501(c)3 organization founded in 2004. We are strongly committed to helping those who have selflessly given to our country and have returned home with serious injuries since September 11, 2001. It is our duty and our honor to assist severely injured veterans and their immediate families by raising donations of money, building materials and professional labor and to coordinate the process of building a home that provides maximum freedom of movement and the ability to live more independently.